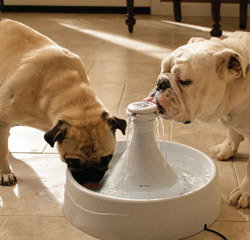 Very soon all Bri tish pet lovers would be able to find in the supermarkets the drinking water, ecpesially designed for pets. Now on the shelves you will find the water with different flavors such as chicken, as well as the one that will be flavored with parsley, which removes bad breath of animals - that will certainly bring a great happiness to the owners of birds, cats, dogs, and (can you believe it!) even snakes. A similar drink is available in the stores of America, it's price is about 10 dollars for 2 liters. American businessman Bill Fells first invented to sell the special water for the animals in the bottles. It happened when he saw that his dog refused to drink water from the tap. It is known that in one year in America, the sale of water for the animals brought two billion dollars.